An often requested feature is a private messaging feature which will allow users to message each other. I'm happy to announce that development is on track for release before the end of the month. I'm also happy to announce that the feature which will be released has become a lot bigger than initially anticipated. Instead of a simple private message feature, the new feature is more like a user-to-user messaging chat. This will allow users to message each other in real time. In addition to this release, public user profiles are now active. More work will be done on this over the next few months, but you can already check it out by clicking on any user's name in the forum. If you have any thoughts on these developments, please post your messages below. This feature is now active along with several other nice goodies :-) A longer post will be added once documentation is updated and things are polished out. To try the chat feature, click on any user's name (eg. in the post) and you'll be able to message the user directly. Note: The person initiating the private user-to-user chat message must be logged in as well! Hi we just started testing out the feature... great start! But we couldn't find out how to view or access the MESSAGE feature – in particular, to see previous messages – when on the main CHAT page. I checked SETTINGS but didn't find it there. (even better) A block called LATEST MESSAGES right below USERS ONLINE? I'd prefer #2 since we could then see quick latest overview at glance before diving into the messages. The feature is still not complete. 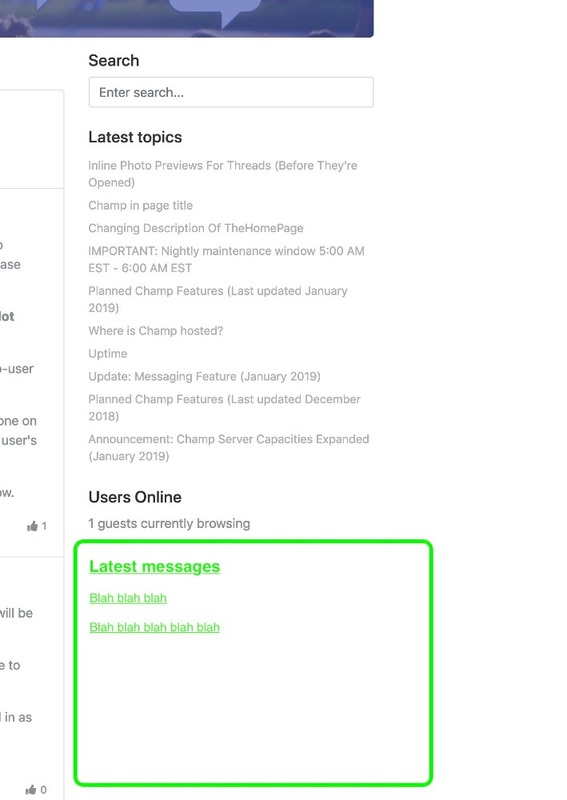 But yes, the typical message features that you might find in something like Facebook Messenger where notifications will be shown somewhere (eventually -- see below). I'm still trying to figure things out in terms of design as making a mistake here will be more problematic down the line. I'll take what you've suggested into consideration as I brainstorm how to approach this. Thank you and keep your feedback coming in.